Letters to the editor (LTE) sections in historical newspaper databases are rich sources for investigating the language pedants’ pet peeves. The split infinitive seems to be among the prominent causes for their perpetual discussions. 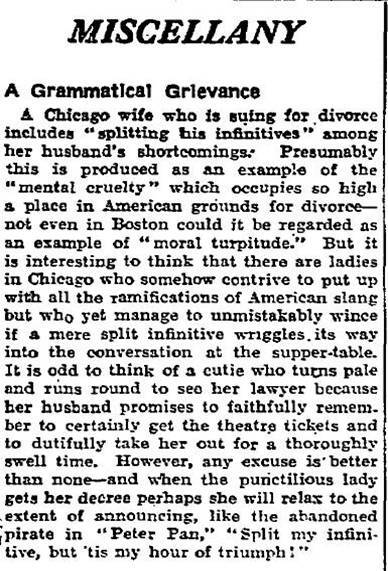 A 1904 article in the Washington Post entitled “Shall the Infinitives do the Split?” reported on the debate on which the jury is still out, judging from the 21st-century LTE exchanges. Politicians, newspaper editors, and, famously, Star Trek screenwriters have been noted to boldly venture into the sphere of this disputed grammatical construction. The printed word has not been the only subject of criticism throughout the years. The 1931 Manchester Guardian article below reports on how the most meticulous language pedants keep their ears out for the matters of language even when it comes to pillow talk. Several decades ago, prior to the general legal acceptance of the no-fault divorce in the US, which today guards privacy behind the veil of “irreconcilable differences”, the petitioners relied on “cruelty” for assuring substantial grounds for their legal case. Apparently, split infinitives were reason enough for suing for divorce. This humorous journalistic relic from the Prohibition Era might resonate well with some contemporary views on the split infinitive and the few (possibly a dying out species?) who, similarly to the British author, still hold the American slang to be primary evidence of the English language decline. This entry was posted in usage features and tagged letter to the editor, prescriptivism, split infinitive. Bookmark the permalink.